EU, the politicians and the bankers have shown by their action, and inaction, that they effectively have canceled the social contract with their own citizen. That unspoken implicit contract between citizens and their rulers that is the backbone of a democratic society. 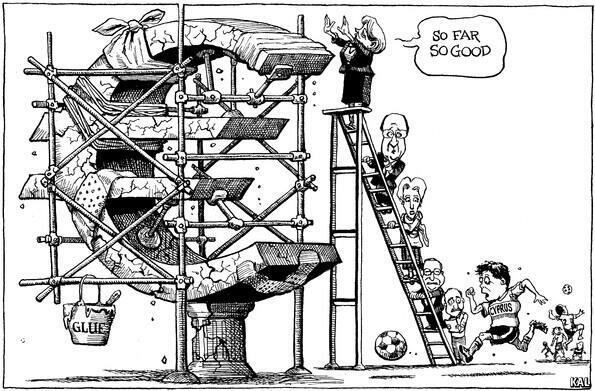 I had planed to write about the recent developments in Cyprus, but now I have so much material that it is ridicules. Every day there are new revelations about what went on behind the scene. And are STILL going on! So I decided to just do a very short version (well, sort of) – Cyprus for dummies so to speak. With some of the more important facts and points among many, many. This is why the Euro is doomed. 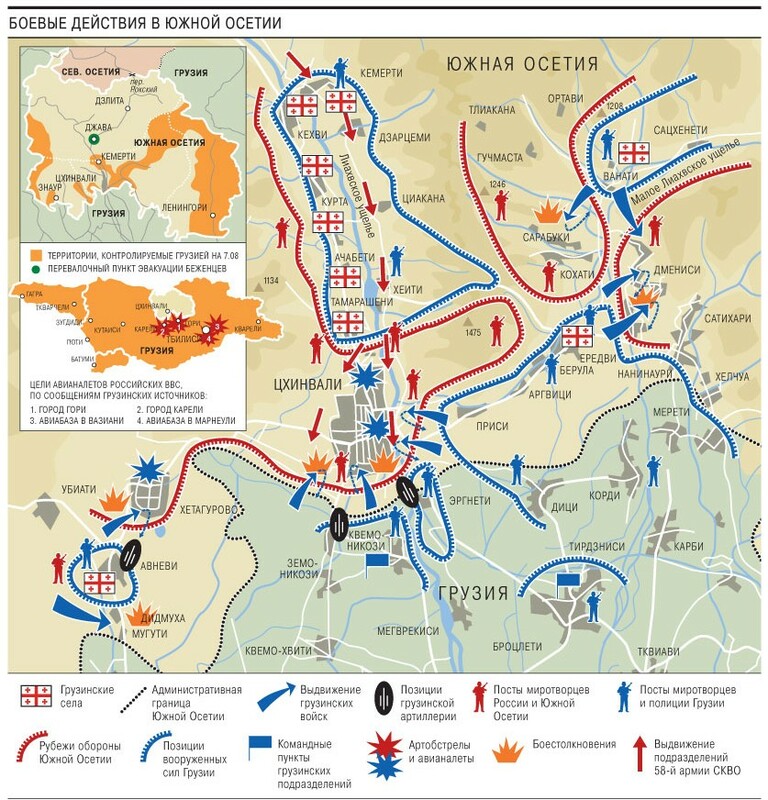 If you try very, very hard, it is still very difficult to underestimate the seriousness of what happened. This is a game changer. Most people, politicians and “journalist” has still not understood the seriousness and graveness of what happened on a local, national and international level There is so much that was broken ON PURPOSE, including the rule of Law. And the very foundation of the modern financial and banking system. Which these measures where supposed to protect. Now anything and everything can and might be done. Whatever boundaries that existed have been breached. There is no Law, no fences and no limits. Pandora’s Box has been opened. No comment whatsoever is need. Read it again and ponder the arrogance and irony of it. “The Web site EUobserver has video of Mr. Juncker, at a conference on economic governance in April, expounding on the practice and reasons for lying in financial and economic communications. Luxembourg Lies on Secret Meeting. .Economic policy of the eurozone needs to be decided in ”dark, secret rooms” . And of course, you have his successor Dutch Finance Minister Jeroen Dijsselbloem, the new president of the Eurogroup council of euro-zone finance ministers. He was talking about the “new template” for further bailouts after Cyprus. Only to retract most of these new rules a couple of hours later – so he didn’t say what he actually said on a recorded interview. And then retract of parts of the previous retract. It’s hard to keep up with all this spin going on. And Jérôme Cahuzac, the Socialist budget minister in France, who had been tasked with battling tax fraud. Who just had to resign because he had an ”undisclosed” Swiss bank account. Minister in charge of battling tax fraud… resigns for having a secret Swiss account. Let that sink in for a bit. French authorities have searched the Paris flat of IMF chief Christine Lagarde as part of an investigation into her handling of a 2008 compensation payment to a businessman supporter of ex-president Nicolas Sarkozy, her lawyer said. Both prime examples of the political class wouldn’t you say? Also, remember that the Cyprus banks went trough the ECB new and “stringent” “stress test” 18 months ago with flying colors. These people REALLY know what they are doing don’t you agree? There you have the setting. 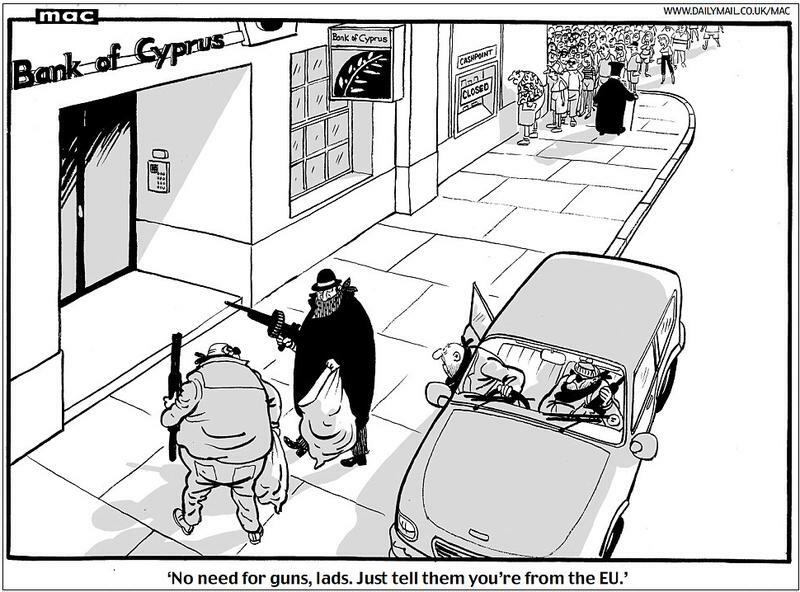 Remember, these people decide your fate and can take your money if they want as has been shown in Cyprus. 1. Let’s start by saying that this “crisis” was known at least two years before it “happened”. And EVERYONE that should, know about it. And they DID ABSOLUTELY NOTHING about it. On the contrary – they even managed to worsen it. Not small feet for our dear politicians and bankers. The “troika” didn’t want to do anything until after the Italian election. Which didn’t go the way the EU bureaucrats wanted. In addition, since the Cyprus communist president from AKEL didn’t want to do anything to be the one that started “tightening of the belt”, the Troika decided to wait after the Cyprus election on February 17 and 24 this year. Now the Troikas “man” Nicos Anastasiades was in power. And now the negotiations started. In the meantime, what was originally a €6 billion bailout in the summer of 2012 was 8 months later a €18 billion bailout. Thanks to EU and IMF doing nothing. Doing nothing, a favorite political “pastime”, has serious consequences, cost REAL money and effects REAL people in the REAL world. Spain, Cyprus Request Bailout Aid . Cyprus financial crisis: the framework for an economic recovery within the eurozone. 2. An interesting fact, which have not been very much noted, is that the Troika from the beginning DID NOT demand a “tax” (confiscation) on deposits from €100 000 and under. It was only on deposits over €100 000 “The Russian money” that was uninsured. But ”their man” Anastasiades refused. He didn’t want to anger Russia to much. It was only after this that EVERY deposit was “taxed” (confiscated). It is interesting isn’t it that the president of Cyprus rather that anger Russia, willingly confiscated the money from the poor, the common people and small businesses in his own country. Remember also that of all the 371,000 deposits in the Cyprus banks 361,000 of them was below €100 000. And supposed to be “insured”. Yeah, we know what that means now! He planned to spend it on his grandchildren – some of whom live in Cyprus – putting them through university and setting them up. There would be medical bills; he has a heart condition. The interest was paying for a comfortable retirement, and trips back to Australia. He also toyed with the idea of buying a boat. He wanted to leave any big purchases a few years, to be sure this was where he would spend his retirement. There was no hurry. But now it is all gone. ”If I made the decision to stay, I was going to build a house,” John says. ”Unfortunately I didn’t make the decision yet. His money was all in the Laiki ”Popular” Bank which was the main casualty of Cyprus’ bailout package set by the European Union. Laiki is to be dismantled. Savings of less than €100,000 are to move to the Bank of Cyprus. Anything more than that will almost certainly be wiped out as the bank is wound down, its remaining assets taken by the bank’s creditors. Last week he heard a rumour that the bank was in trouble and went into Aiya Napa to ask his bank manager – a friend – if he should move his life savings. ”There’s no problem, nothing to worry about,” he was told. John’s tears flow. As he chokes up, his son George, who moved to Cyprus in 1990, explains. ”The whole family, we used to work at the markets. I would work at the markets on the weekend to help my parents while my mates were off having fun. Honest work in honest jobs. Now all that hard work is paying the debts of other people and the government. It’s disgusting, to be honest. ”For the moment I am ‘sitting on charcoal’, as they say,” waiting to see if he gets burnt. 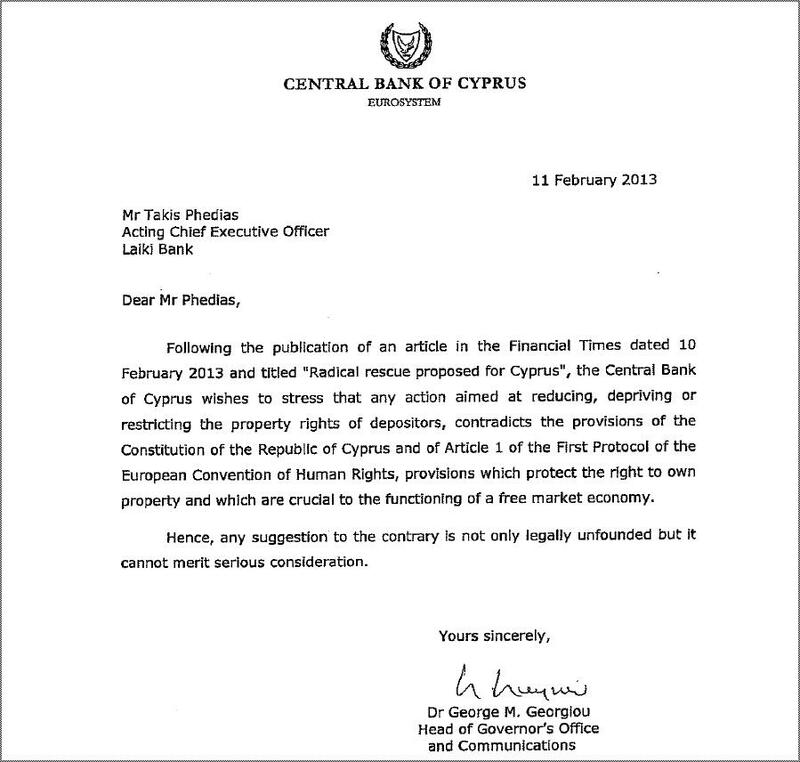 Memo from the Central Bank of Cyprus sent to bank CEOs on February 11, to put them at ease. 3. And the Troika in their eagerness agreed to this. Thereby destroying the very foundation of the modern financial and banking system. Including the “protection” for deposits under € 100 000 in EU. Which was the backbone to restore “confidence” in the banks after ALL their mismanagement, speculations and crisis. No Deposits – No Banks. It’s very simple really. You see nearly ALL the money they use to “invest” or speculate is yours, the depositors. And because the high leverage they have used on this money, they are in trouble. And they know it. So if you start taking out your money the whole deck of card will collapse. Why should you keep YOUR money in the banks after this? When you know that at a moments notice (on a weekend so you can do nothing), the politicians can decide that you should “help” finance this or that for “the common good”. Which of course they decide. No to mention that you don’t get any rent to speak off on you money in the banks. And on that miniscule rent, you have to pay taxes. And you lose eve more when you consider the REAL inflation in each country. Our “dear” politicians have now for a long time in their actions, taxes, laws etc; favored loans and debt, and punished saving. Sounds like a ”healthy” strategy for the long time doesn’t it? Some countries, like USA, use this strategy to drive down the value of the currency and thereby their cost of the national debt. 4. During the time when the banks where closed (11 days), and the accounts “frozen” and the common people could only take out a daily limited amount trough the ATM machines. At the same time, you get so impressed by this people and their total lack of knowledge and understanding of what they decide, the Cyprus banks filial in London and Moscow (Uniastrum Bank) where open with NO RESTRICTIONS AT ALL. And every one from five years and upwards can guess what happened next except the Troika and the EU politicians. Most of the money from the big accounts where transferred or withdrawn. Including from a lot of Cyprus politicians, including the presidents family. So the very money that was the target and the bulk of the €5.8 billion that Cyprus was to “put up”, the Russian money, was allowed to “escape”. As a consequence the Cyprus Centeral Bank would need a big increase in emergency funding from the ECB in the form of ELA to make up for the deposit outflows. Which is precisely what happened. These are the politicians that “tax” (confiscate) YOUR money in the banks. 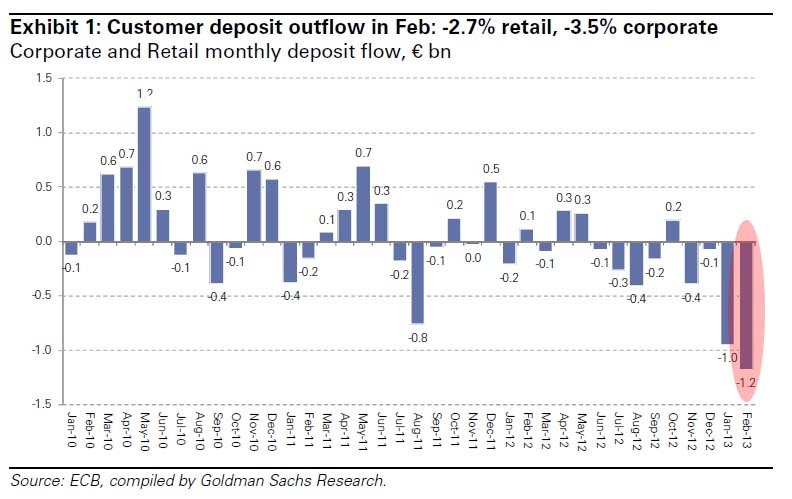 The people in the know already started the outflow from Cyprus in January. As a result, they have to take a MUCH BIGGER percentage of these big accounts left, mostly local businesses. You can see one example here, This IT company had €849.682 on it’s company account. They confiscated €720.898. That’s 85% of the company’s account! This company has consequently gone bankrupt and has fired all the Cypriots that worked there. That’s REALLY going to be helpful for the local economy don’t you think? Another effect that has started to emerge this week is that international companies, customers, clients etc, have told local Cyprus companies that they will no longer sign contracts with a Cypriot company. Overnight, the jurisdiction is a pariah. This will of course do even “more wonders” for the local economy and “help” them recover. Then there is the spreading of the economic downturn effect because of these measures, which are now hitting Greece. Greece has already had three bailouts and still the economic situation is getting worse. And now this. “At least 1,600 Greek businesses – from shipping, retail to tourism – will suffer from the Cyprus bailout deal announced on Sunday after a showdown between Brussels and Nicosia, according to Vasilis Korkidis, head of the National Confederation of Greek Commerce (ESEE). “The tragic situation in Cyprus will certainly have immediate effects on the Greek market, since a large part of the domestic businesses maintain close ties with Cypriot companies,” Korkidis said in a statement on Tuesday. He was particularly critical of the capital controls and the impending haircut on large deposits (over 100,000 euros) expected to be more than 40%. And of course there is the Capital Controls that are now imposed since the banks opened. With “a little help” from EU and IMF you can really be ruined wouldn’t you say? You can take this example of this company and the example of pensioner John Demitriou above whose life savings were confiscated. And remember, he went to the bank just two days before they closed and confiscated his money, and asked his bank manager – a friend – if he should move his life savings. “A company owned by in-laws of Cypriot President Nicos Anastasiades withdrew dozens of millions from Laiki Bank on March 12 and 13, according to an article published in Cypriot newspaper Haravgi. It is a VERY; VERY; VERY; VERY long time since politicians took the motto “to serve and protect” it’s people seriously. Here in Sweden because of money laundering laws, you have to register and give full personal details when you buy a buss or subway ticket by your mobile phone. We are talking about $3-4 /ticket. And in the examples above, we are talking about billions of euros. WHEN THE BANKS WERE CLOSED AND SUPPOSEDLY MONITORED. It cannot be more pedagogic and clearer that this. One rule and monitoring/surveillance for the common people and their $3-4 tickets. 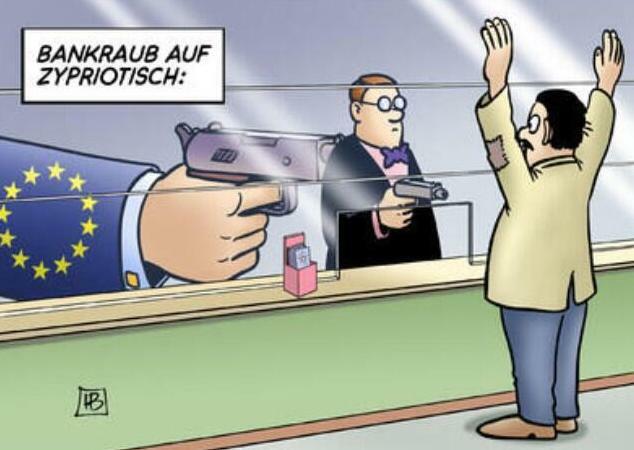 Another for the political class/elites were billions of euros are allowed to escape from closed and supervised banks. And remember, we are paying them! And they are the ones that put the money laundering laws in place and enforce them on us. 5. A key goal throughout these negotiations has been to make Cypriot debt “sustainable”. The effect of the Troikas measures is more than likely to collapse the GDP in Cyprus. 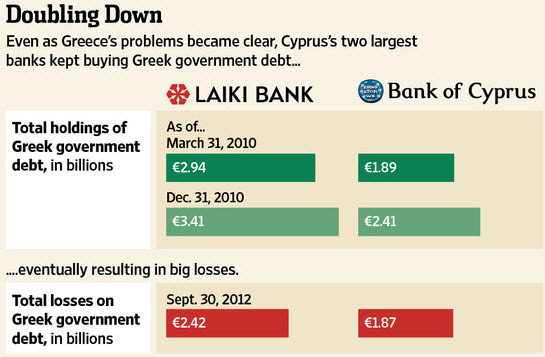 The €10bn bailout was supposed to push Cypriot debt down to 140% of GDP. If Cypriot GDP falls by just a couple of percentage this year (which is now guarantied), that percentage rises drastically. So we are back where we started. 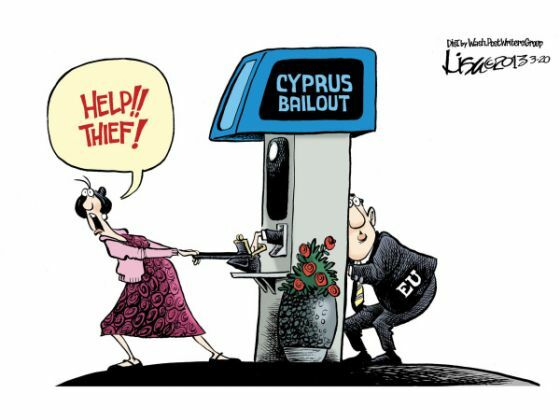 With Cyprus needing even more and bigger “bailouts”. 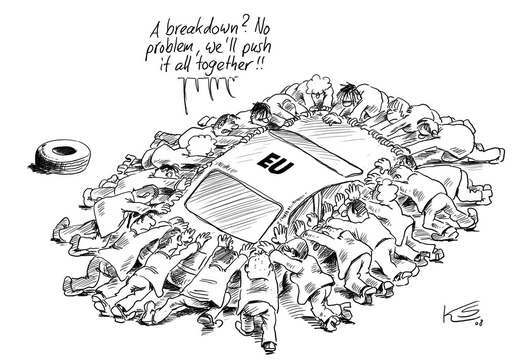 Or how EU shot itself in the head, arms, stomach and both legs at the same time. Congratulating itself ate the same time for this “great achievement”. “A list of Cypriot companies and politicians that allegedly had millions of euros in loans written off by the three Cypriot lenders at a center of an unprecedented banking crisis on the Mediterranean island has been forward to Cyprus’s parliamentary ethics committee after its publication in Greece’s daily Ethnos newspaper. According to the revelations, Bank of Cyprus, Hellenic Bank(Laiki) and Hellenic Bank — which were earlier this week acquired by Greece’s Piraeus Bank — has forgiven companies, MPs and local authority officials millions of euros in loans over the past five years. “According to Ethnos, Bank of Cyprus wrote off the 2.8-million-euro loan of a hotel with ties to the communist-rooted Progressive Party (AKEL) and forgave significant portions of many other loans. For instance a national labor union is said to have been forgiven 193,000 euros of a 554,000-euro loan. An unnamed company was forgiven 110,000 euros from a 1.83-million-euro loan, a prominent deputy of the centrist Democratic Rally (DISY) party saw 101,000 euros of a 168,000-euro loan written off and a company owned by the brother of a former minister of the conservative Democratic Party (DIKO) had 1.28 million euros of a 1.59-million-euro loan written off. The list refers to several other MPs and the mayor of large city who allegedly had significant portions of their loans forgiven by Bank of Cyprus. Companies linked to a member of the bank’s board, to the daughter-in-law of a DIKO deputy and several others also appear to have been offered significant loan relief by the Bank of Cyprus. “THE government yesterday reaffirmed its intention to fully investigate the banking sector, as a list surfaced with names of current and former state officials who allegedly had their loans written off by banks. The list, published in Greece, contains the names of former and current MPs as well as other prominent individuals, including former president George Vassiliou. According to the report, Vassiliou held a 51 per cent stake in a company that agreed to have $5.8 million written off. “ What the common theme here is that the very same Members of Parliament who were so vocal in rejecting the insured depositors’ impairment just to save their skins from a public mutiny (but so quick to sacrifice the wealthier citizens and small and medium corporations to a haircut that may be as deposit large as 100%), did everything in their power to avoid a vote on the final bank ”resolution” which effectively handed over the country’s sovereignty into the hands of the Troika and its liquidators, but not before they themselves were among the key beneficiaries of the impairments on the banking system’s asset side. It is these bad assets and impaired losses, as well as investing money in Greek bonds, and other worthless ”assets”, that ultimately ended up forcing the restructuring of the bank and the cram up of the liability side up to and including the unsecured loans known as deposits. Yiannakis Omirou, Cypriot House of Representatives President, who just last week, was calling for the nation to accept it is ”time for responsibility” as they progressed towards a final solution. “There is no other alternative but to free Cyprus from the bonds of the troika and the memorandum, House of Representatives President Yiannakis Omirou has said. Omirou also expressed his conviction that no Attorney General would dream of not following through with the results of an investigation led by an independent committee to apportion blame on those responsible for bringing the country’s economy and banking sector near collapse. Omirou talked about the troika demands, which according to him will multiply and will turn Cyprus to a colony of the worst possible type and warned “I would like to send a message to the Cyprus people that there is no other way, there is no alternative apart from freeing (the country) from the troika’s and the memorandum’s bonds”. He noted that certainly, “this road will demand sacrifices”, adding that “by leaving the troika and the EMS behind us, we will ensure our national independence, our national sovereignty, our moral integrity and our economic independence”. 7. 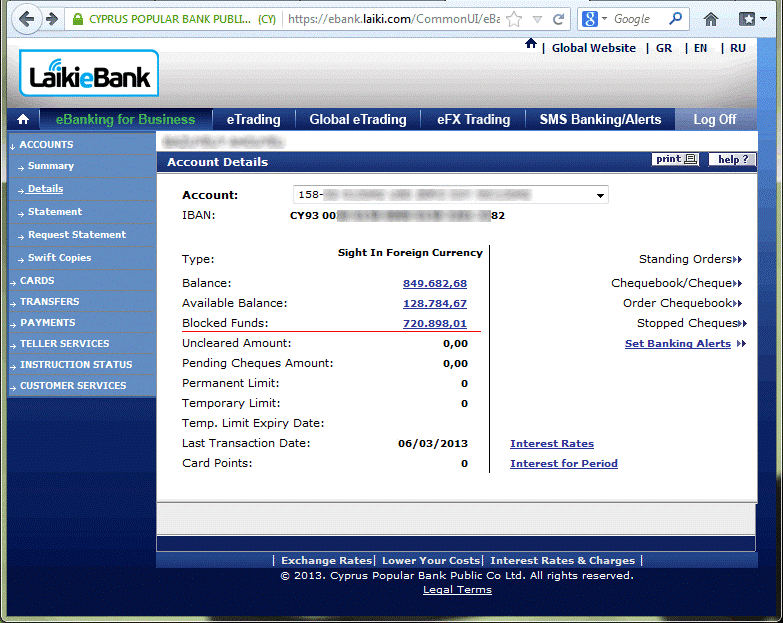 When Greek bonds were the most toxic investment avalibale, the Cyprus bank was bying them like mad. One of them was Laiki Bank’s chief risk officer Dimitris Spanodimos. Thanks to huge deposits from Russia this left them with, in Spanodimos’ words, ”comfortable liquidity and capital position to deepen selectively some highly profitable and highly promising client relationships.” In short, they had so much cash that they had to invest it somewhere. And they were encoruged to this by the ECB too. And remember – this was their CHIEF RISK OFFICER. Don’t you feel assured by these banks and their “risk officers”? “In August 2010, Greece’s economy was tumbling into depression amid angry street protests and a €110 billion bailout. Dimitris Spanodimos, the chief risk officer of Cyprus’s second-largest bank, remained bullish. Mr. Spanodimos boasted on an Aug. 31, 2010, conference call with analysts that the bank was expanding faster than rivals in Greece and bulking up on residential mortgages. ”We have used our group’s comfortable liquidity and capital position to deepen selectively some highly profitable and highly promising client relationships,” he said. “An examination of regulatory documents, conference-call transcripts and financial filings shows that both banks gorged on Greece while nearly everyone else was purging. In late 2010, even after German and French leaders had openly agreed that creditors of fiscally weak governments should take losses on future bailouts, the two Cypriot banks appeared nonchalant about their exposure to Greek government bonds. By the end of the year, according to European regulators, the two banks had a combined €5.8 billion ($7.5 billion) of Greek government bonds—€1 billion more than they had held just nine months earlier, and a sum equivalent to about one-third of Cyprus’s annual economic output. By comparison, over the same period, Barclays cut its Greek government exposure by more than half. Both Cypriot banks passed Europe-wide stress tests in 2010, relieving them of pressure to change course. They passed again in 2011. ”Their regulator was clearly signaling it was OK to go on” expanding in Greece, said Christine Johnson, a bond-fund manager at Old Mutual Global Investors in London, referring to Cyprus’s central bank and European banking regulators. In July 2010, a pan-EU regulator conducted ”stress tests” of banks to gauge how they would fare if economic conditions worsened. Crucially, the tests modeled the impact of the economy on loan portfolios but didn’t contemplate the possibility that government bonds could produce losses. “In 2011, the European Banking Authority ordered more stress tests. Like the ones the previous year, they didn’t contemplate losses on government bonds. 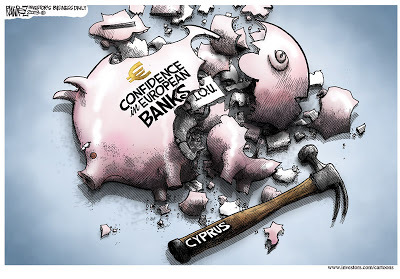 The two Cypriot banks were again found to have plenty of capital to withstand a deteriorating economic environment. On Dec. 8, 2011, the EBA tried for the third time to come to grips with the capital deficits at major European banks. This time, the authority factored in possible government-bond losses and concluded that Bank of Cyprus and Cyprus Popular were among 31 banks that needed to come up with new capital. Bank of Cyprus‘s estimated deficit was €1.56 billion and Cyprus Popular’s was €1.97 billion. The banks had until June 2012 to come up with the new capital. 8. 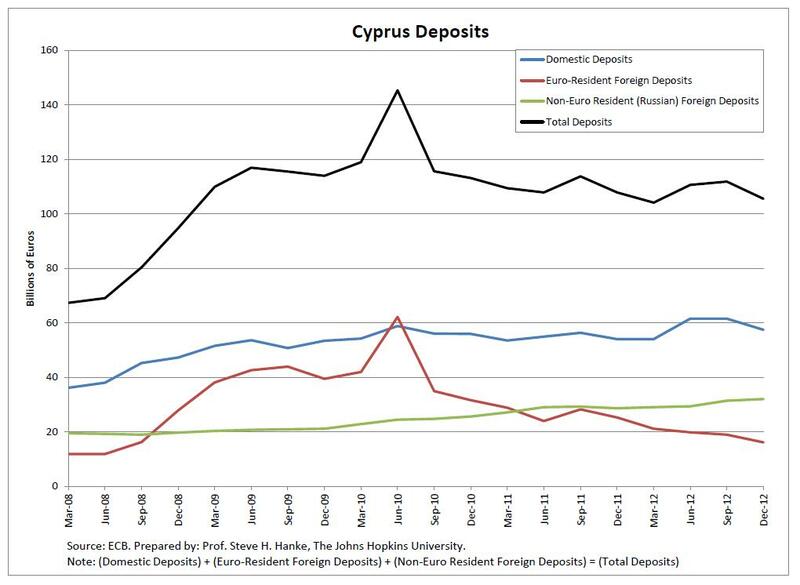 The lies and delusions – when Cyprus’ Massive Deposits Were A Great Thing. 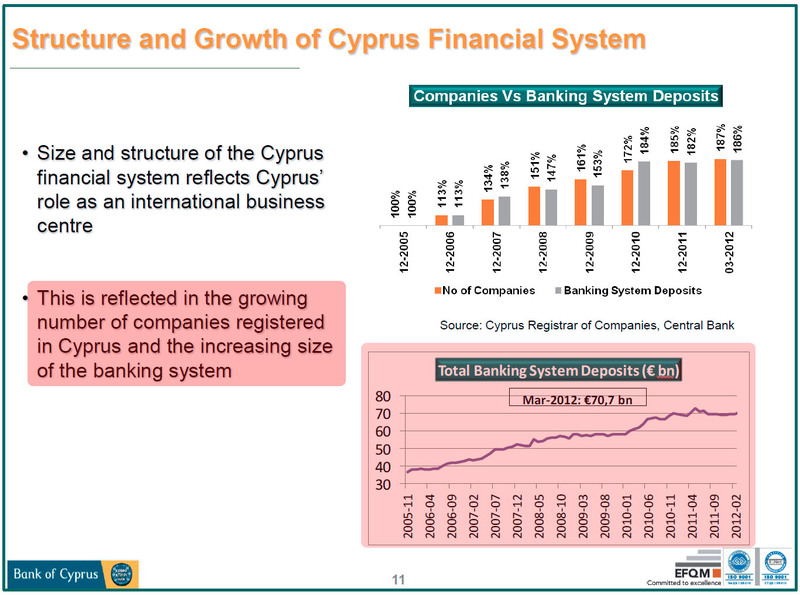 As recently as 10 months ago, as this May 2012 presentation from the Bank of Cyprus titled ”International Banking Services: Strategic Business Crossroad – A Reliable Financial Center”. Some quotes ”Size and structure of the Cyprus financial system reflects Cyprus’ role as an international business centre” and that ”This is reflected in the growing number of companies registered in Cyprus and the increasing size of the banking system” as measured by the record amount of banking deposits. 9. 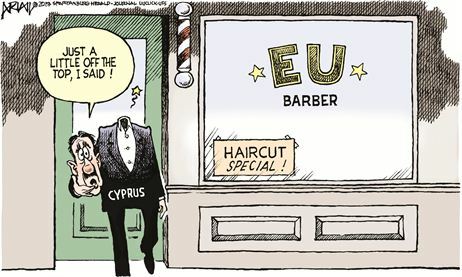 With the bailout also comes a “straightjacket” of orders, rules and regulations from the Troika for the Cyprus government to implement. This is what happens when you have irresponsible politicians, irresponsible bankers that speculate and when you are a member of the Eurozone. It is not just all the taxes (confiscation) of deposits, it is also the Memorandum of Understanding from the Troika which dictates terms for the Cyprus government revenue increases and spending cuts as a prerecusite for the “loan”. Below is a leaked draft of the revised Cypriot MOU being prepared by the head of the IMF mission to the island nation, Delia Velculescu. This is very detailed. And I put it here so people can begin to understand the depth and width of these regulations. It goes to the heart of most peoples lifes. This is what heppens when you are indebted over your ears and can not pay. And remember, these same politicans behind this MOU are the same politicans that are putting us all into more debt every year. Which our grandchildren still have to be paying. •Reduce certain benefits and privileges for state officials and senior government officials, in particular by suspending the right to travel first/business class by state officials, senior government officials and employees with the exception of transatlantic travel. •Increase the standard VAT rate from 17% to 18%. •Increase excise duties on tobacco products, in particular on fine-cut smoking tobacco, from EUR 60/kg to EUR 150/kg. Increase excise duties on cigarettes by EUR 0.20/per packet of 20 cigarettes. •Ensure a reduction of seasonal hourly paid employees by 992 from 1806 in 2012 to 814. •Implement a four-year plan as prepared by the Public Administration and Personnel Department aimed at the abolition of at least 1880 permanent posts over the period 2013-2016. •Increase the statutory corporate income tax rate to 12.5%; Increase the tax rate on interest and dividend income to 30%. •Undertake a reform of the tax system for motor vehicles, based on environmentally-friendly principles, with a view to raising additional revenues, through the annual road tax, the registration fee and excise duties, including motor fuel duties. •Ensure a reduction in total outlays for social transfers by at least EUR 113 million through: (a) the abolition of a number of redundant and overlapping schemes such as the mothers allowance, other family allowances and educational allowances; and (b) the abolition of supplementary allowances under public assistance, the abolition of the special grant and the streamlining of the Easter allowance for pensioners. •Ensure a reduction of at least EUR 29 million in the total outlays of allowances for employees in the public and broader public sector by i) taxing pensionable allowances provided to senior government officials and employees (secretarial services, representation, and hospitality allowances) in the public and broader public sector ii) reducing the allowances provided to broader public sector employees and reducing all other allowances of broader public sector employees, government officials and hourly paid employees by 15%; and iii) reducing the daily overseas subsistence allowance for business trips by 15%. Ensure a further reduction the subsistence allowance of the current allowance when lunch/dinner is offered by 50% (20% – 45% of overseas subsistence allowance instead of 40% – 90% currently paid). •Increase excise duties on beer by 25% from EUR 4.78 per hl to EUR 6.00 per hl per degree of pure alcohol of final product. Increase excise duties on ethyl alcohol from EUR 598.01 to EUR 956.82 per hl of pure alcohol. OK, I stop here. It’s already way to long. But it is important that you get a true picture of what is happening and why. As I said in the beginning, there a lots of other points to be made but then this post would have been 90+ pages more. And that is for another day.